Originally from the Los Angeles area, where she grew up riding horses, Marisa likes to spend time outdoors and achieved a personal goal by completing her first Sprint Triathalon in 2012. An avid photographer, Marisa enjoys taking pictures of her favorite subjects –her two young children. Marisa participates in fundraising for the Santa Barbara Cottage Children’s Hospital and has served as a guest speaker at UCSB’s Global and International Studies Program. 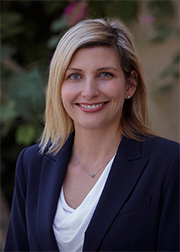 Marisa enjoys working with people to solve often complicated family law issues. She also represents clients on many different types of school law, business and civil litigation matters.